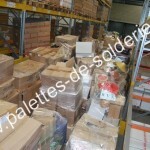 The Pallet Outlet is the ideal product for soldeur. The stock value of these pallets and about 2500 euros per lot of 30 and up to 6000 euros according to the arrivals. Our price is only 195 euros HT the pallet to a minimum of 30 (full trailer truck) with possibility of delivery. This represents a purchase total of 5850 euros HT only for in-store purchase value of 60 000 to 75 000, or – 10% of the retail price.